Mary Meeker's annual Internet Trends Report is a massive 294-page analysis of digital technologies that impact everyone, particularly financial institutions. Here's what bank and credit union marketers need to know to prepare their organizations for the future. 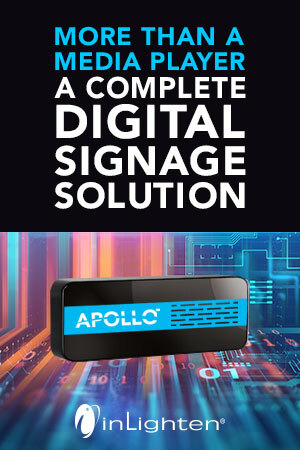 We have come to a time where almost everyone globally is aware of the power of digital technology and the internet. In fact, in developed countries, accessibility to data and usage of the internet (many times by a mobile device) is taken for granted. That was the primary takeaway from Mary Meeker’s 23rd annual Internet Trends 2018 Report. Two years ago, Meeker started her presentation with the fact that there were 3 billion Internet users worldwide (42% of the world’s population). This year, more than half the world’s population are Internet users for the first time (3.6 billion). So how do the findings in this massive 294-page report impact the financial services sector? For one thing, offering internet-based products and services is no longer optional. In fact, offering online and mobile banking are no more than table stakes today, with removing friction, focusing on digital design and leveraging consumer insight and advanced analytics to provide personalized experiences are the new table stakes for success. 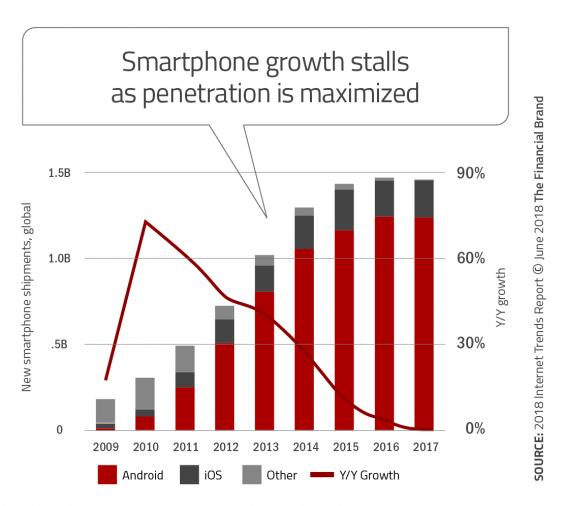 In addition to slowing Internet growth, growth of smartphone shipments are also stalling. In fact, 2017 was the first year in which smartphone unit shipments didn’t increase. This is caused by the ‘law of large numbers’, where there is almost complete penetration of people who want to be smartphone owners. “When markets reach mainstream,” Meeker writes, “new growth gets harder to find — evinced by 0% new smartphone unit shipment growth in 2017.” This isn’t really a negative scenario for the financial services community however. Especially since usage by those who own smartphones is continuing to increase. According to the Internet Trends Report, adults in the U.S. spent 5.9 hours per day on digital media in 2017, versus 5.6 hours in 2016. Some 3.3 of those hours were spent on mobile, which is responsible for overall growth in digital media consumption. This growth was more than double the 1.6 hours spent in 2012, and came at the expense of desktop and laptop usage. 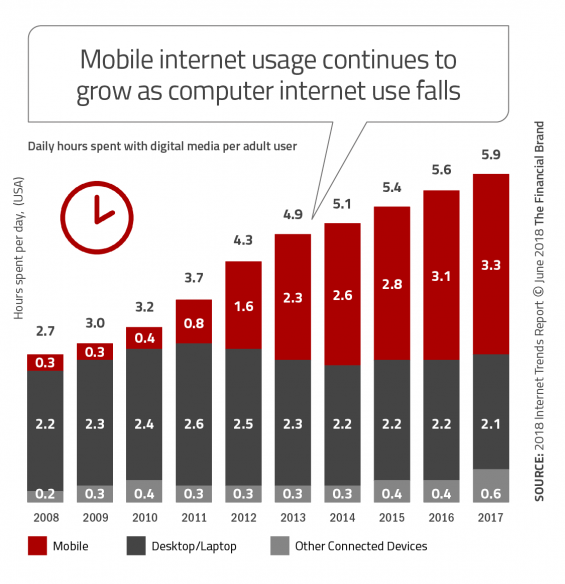 In other words, mobile internet usage is king. While data-driven personalization is key to improving user experiences, the report highlights that there can be a downside on the privacy front – the rise of the “privacy paradox”. Another impact of the increase of mobile usage is the impact on mobile payments worldwide. 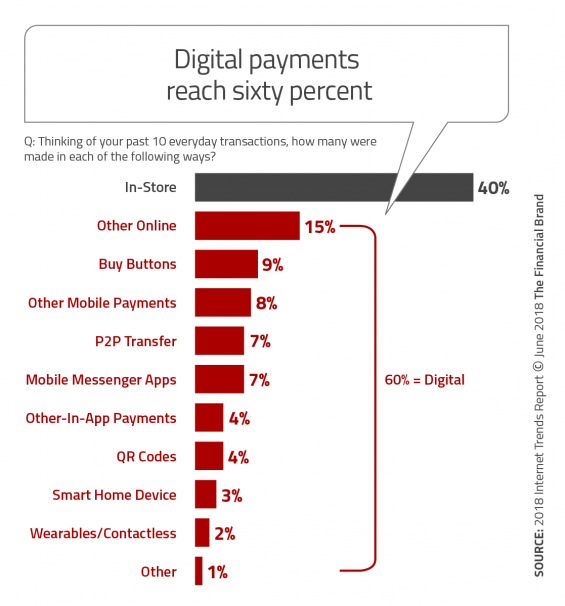 In 2017, around 60% of all payment transactions were done digitally, with China continuing to lead the rest of the world in mobile payment adoption with over 500 million active mobile payment users. 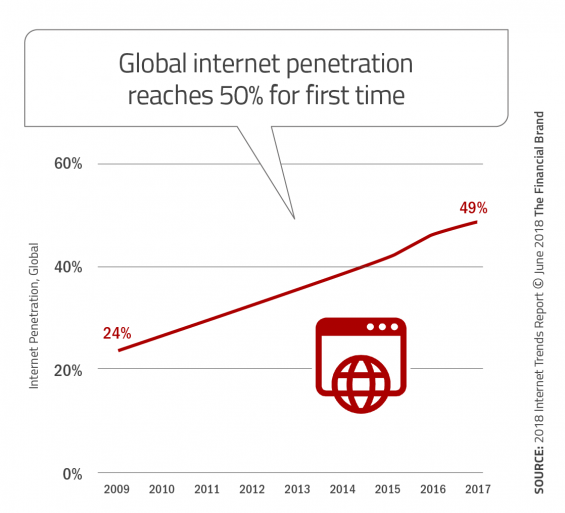 This trend is expected to continue worldwide, with mobile and digital payments increasing as online retailing and digital banking continue to expand. People are also watching more mobile videos that ever before (30 minutes each day), and are shifting their time spent on mobile faster than ad dollars can keep up. 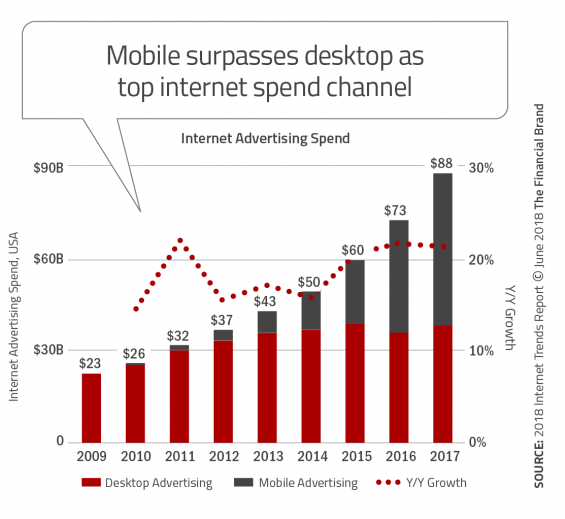 According to the Internet Trends Report, 29% of time spent in media (print, radio, TV, desktop, and mobile) occurs on mobile devices, yet marketers are allocating just 26% of their advertising budgets to mobile executions. According to Meeker, this three-percentage-point gap equals a $7 billion missed opportunity. Consumers are increasingly using social media channels to check prices, products, ratings and availability. According to the report, 44% of consumers bought a product online later after social media discovery and 11% purchased immediately. E-commerce sales reached upward of $450 billion, a 16% year-over-year lift. 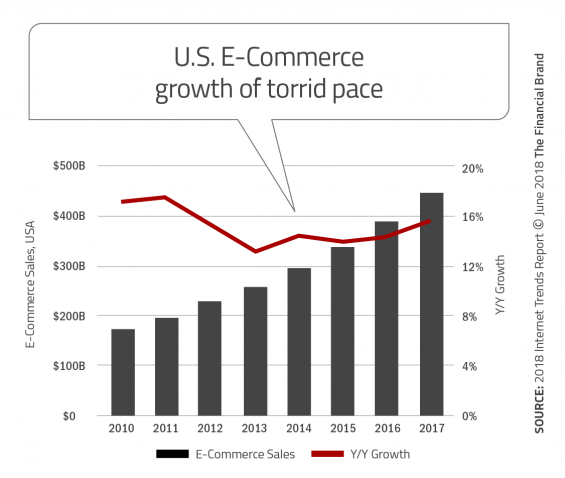 The e-commerce growth rate is up compared to the 14% year-over-year increase last year. Mobile shopping is also on the rise, with app sessions growing 54% year over year. In fact, mobile shopping represented the fastest-growing app session. In addition, more people start product searches on Amazon than on an internet browser now – though they still rely on social media for inspiration to buy. 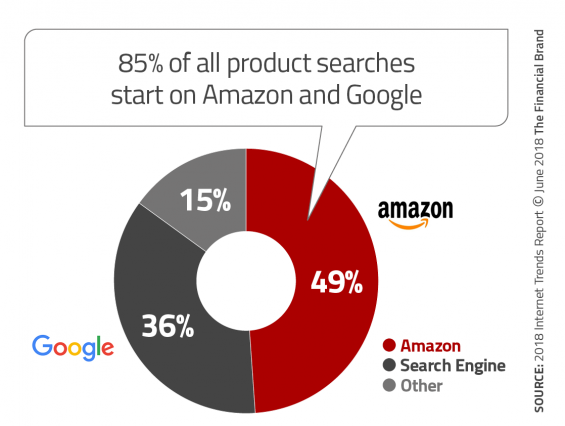 In total, 85% of all product searches begin on either Amazon or Google. 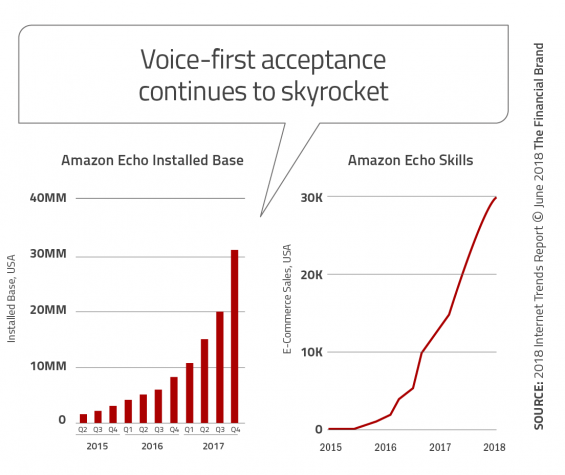 The slide below shows the rise in adoption through 2017, with the chart on the right showing the steep rise in “skills” possessed by the conversational device. Bottom line, the purchase of digital assistants and use of voice devices for basic functions will eventually require organizations to provide voice functionality beyond the basics. Mary Meeker made a point to reference 2017 as the “year of the voice,” as mainstream adoption of AI-powered smart speakers continued its rapid acceleration. 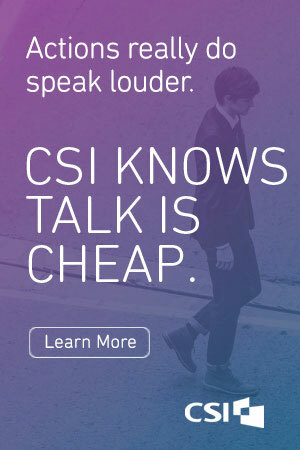 According to the report, speech recognition has reached 95% accuracy in some cases, providing the fuel for smart speakers to take off. The report references that the number Amazon Echos in the U.S. went from 10 million to more than 30 million in 2017. This article was originally published on June 4, 2018 . All content © 2019 by The Financial Brand and may not be reproduced by any means without permission.